Increasingly, people are carrying a multitude of hand-held devices including perhaps a cell phone, MP3 player and even a GPS and keeping these devices charged whilst on-the-go is an ongoing problem. 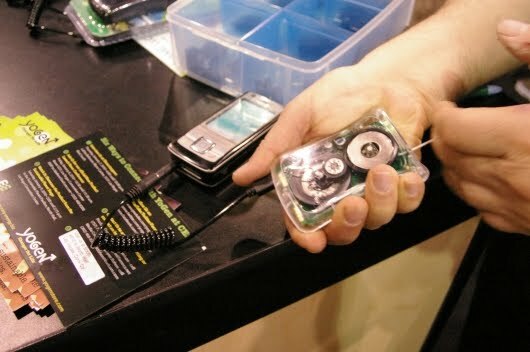 There could be a simple solution - Easy Energy, Inc has brought its clever YoGen charger to CES 2010. This unique and easy to use, hand-powered charger is a pocket-sized dynamo. It is designed to charge small portable devices such as mobile phones and MP3 players and unlike other battery-free chargers this one doesn't rely on the sun for its power - it uses 'elbow grease' instead. The YoGen charger works a little bit like the friction cord on the back of a talking doll – you simply repeatedly pull the T-handle and the internal alternator starts spinning. This eventually creates enough power to charge the batteries of most small, portable electronic devices. The ergonomic design of YoGen offers extended charging effort with little operator fatigue. Importantly, it provides 100% green energy and mostly charges devices with only a few minutes of pulling and releasing the T-bar. It is rugged and tough enough to put up with constant use and there’s a convenient LED indicator that shows the actual charging of the device the YoGen is attached to. At 2.1" W x 3.5" L x 0.9" D, it is small enough to carry in your pocket and it has a spiral master cable and interchangeable connector tips to suit most cell phones and other devices. It also contains a built-in power manager that prevents users from overcharging and damaging their electronic devices. The device retails for USD39.99 and is available from YoGen. The video below demonstrates just how easy YoGen is to operate. There’s good news on the horizon for larger electronic devices too - YoGen Max is coming and it will have the capability to power computers.